Futurist George Orwell envisioned that humans would become more like machines and machines would become more like humans. Whilst Orwell was correct to some degree, we seem to be coming to the crossroads where eventually machines could outperform humans and free them from monotonous labour tasks. Take the construction industry for instance. With the global brick laying market worth around $100-200BN, the sector is ripe for a savvy building technologist to step in with game changing technology. 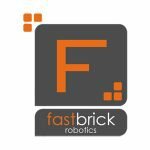 Originally designed to help meet the bricklaying labour shortage, Fastbrick Robotics’ (ASX:FBR) fully automated, end-to-end 3D printing brick laying “Hadrian X” machine can lay 1000 bricks per hour. It’s actually 150 superbricks that are 500mm x 250mm x 250 mm in size compared to the standard measure used in current construction of 76mm x 230mm x 110mm, hence why the company states 1000. Compare the Hadrian X, able to lay 1000 bricks per hour to the human average of 300-500 per day... it’s not even close. FBR’s technology can double the daily output of a top bricklayer in just one hour. The Hadrian X itself is designed to build an entire house in two days, compared to the current 3-5 weeks using human labour. 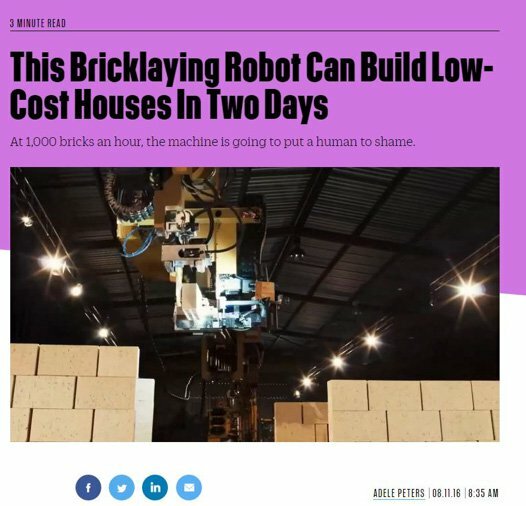 In fact, FBR plans to begin building its first homes in Australia in the third quarter of 2017, and manufacture about 8000 of the robots over the next decade. Remember, however, that this company is still in its early stages of development, so seek the advice of a professional financial advisor if considering investing in this stock. FBR’s device can operate 24×7 for 365 days a year – not needing lunch breaks, vacations or time off during Christmas. Such is the innovative nature of the technology, FBR was selected as a finalist in the WA innovator of the Year program in the ‘Emerging Innovation’ Category for its work with its original Hadrian 105 technology demonstrator, as well as the Hadrian X commercial prototype design. 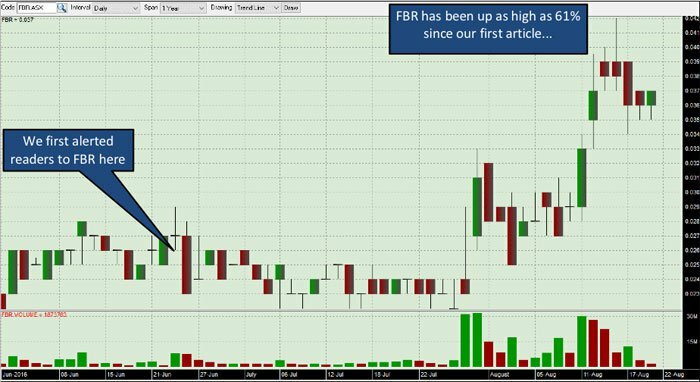 On the back of all the positive publicity it has received, the next step for FBR is to scope out potential partners for distribution and manufacturing, and generate investor and media interest in the US. 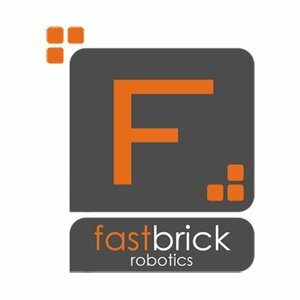 Fastbrick Robotics (ASX:FBR) has been the recent beneficiary of sustained global media coverage, covering its unique bricklaying technology set to shake up the construction industry. Further spotlight has been cast onto FBR with the company selected as a finalist in the Western Australian ‘Innovator of the Year’ program run by the office of the Government Chief Information Officer. This is indeed a substantial validation of FBR’s technology. As the company gears up toward full industry roll out, this growth may just be the beginning for this stock. FBR’s rise in the public spotlight began with its Hadrian 105 prototype which recently completed the world’s first 3D printed multi-room structure. For the first time in history a multi-room structure was built using end-to-end fully automated 3D printing technology. 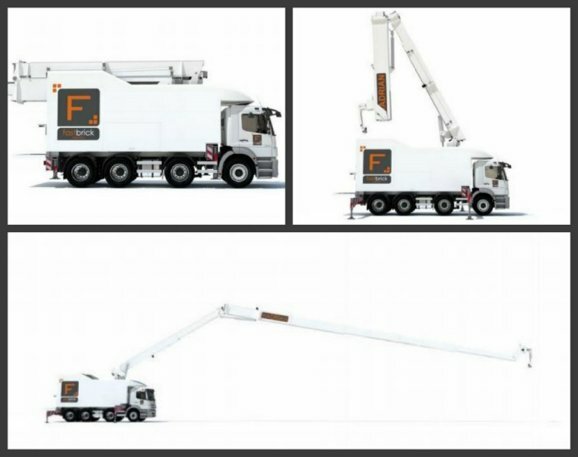 The feat was achieved with FBR’s initial model, the Hadrian 105, which is capable of laying 225 standard brick equivalents per hour. Clearly this technology is not just ‘another brick in the wall’. As witnessed in the video, the Hadrian 105 does everything from de-hacking of the bricks from the pallet, automated handling and placement of bricks into the boom delivery conveyor, the adhesive application to hold the structure together, and accurate brick placement using laser guidance for precision. The entire structure was built from a 3D CAD (Computer Aided Design) file. With the completion of testing on the Hadrian 105 prototype, construction has begun on the next generation first Hadrian X commercial prototype, along with patents filed for several new technologies that will be installed in the Hadrian X. These patents add to FBR’s already impressive IP catalogue. Again however, it is still an early stage play, thus caution should be applied to your investment decision. The Hadrian 105 prototype was just the first step on FBR’s step-change journey and it is now moving beyond prototype stage to deliver its commercial reality through the Hadrian X. The addressable global market for FBR is $100-200BN a year, meanwhile the market cap of the Aussie tech company is currently hovering around $25M. If FBR can capture even a quarter of a percent of the total market, it could see a substantial rise in its market value. With 300 billion bricks being laid around the world each year, FBRs technology could be the game changer the industry has been waiting for as problems for the sector begin to surface. Technology in the construction industry has failed to advance from conventional building methods and there is a major shortage of bricklayers in the industry, more so than any other trade. This skill and labour shortage has driven up wages for bricklayers and added to the cost of building a home. In fact labour inefficiencies, wasted materials and poor communication account for annual industry losses of $120BN globally. With governments and policy makers around the world already facing serious housing affordability issues, FBR presents a viable solution they will soon be able to deploy. FBR plans to begin building its first homes in Australia in Q3 of 2017, with further plans to manufacture around 8000 Hadrian X’s over the next decade. 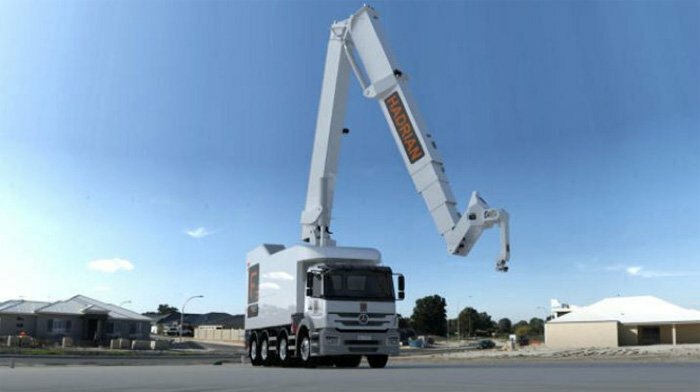 The Hadrian X is the world’s first fully automated end-to-end bricklaying robot, delivering significant time, cost, quality, accuracy and safety benefits to the construction industry. FBR is currently well funded with $3.6M in the bank at end of the last quarter, and plans to roll-out its technology to market by 2018. Through its game changing technology, FBR has been selected as a finalist in the WA Innovator of the Year program. Run by the office of the Government Chief Information Officer, the program provides support for innovators and entrepreneurs across Western Australia. The nomination for the Emerging Innovation Category award came as a result of FBR’s work with the Hadrian 105 technology demonstration and the Hadrian X commercial prototype design. Recognition from a government body bodes well for FBR and provides validation that its technology is on the right track to substantially transform the construction industry. With only four contestants left FBR stands a good chance at winning, with the first place getter of the WA Innovator of the Year award receiving a $75,000 prize. The winner is due to be announced on 2 November 2016 and should FBR win, it would give them a big boost in the marketplace and a little extra cash to further its roll-out. The three big selling points for FBR’s technology relates to time saving, cost reduction and safety. Mounted on the back of a truck, the Hadrian X is driven to the building site. From there the machine is able to stay in one position the whole time as it builds the house, performing a 3D scan to determine where to lay the bricks before beginning operations using its 30m boom. 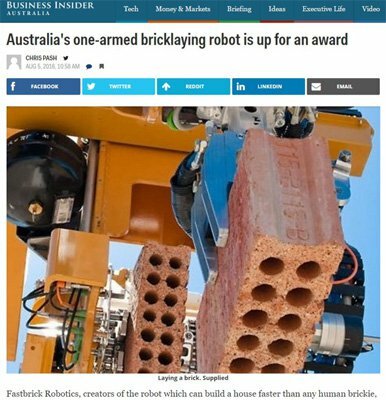 Bricks can be laid 24 hours a day without the machine tiring as humans do. Adhesive is applied by the Hadrian machine, instead of traditional mortar, which improves thermal efficiency. FBRs technology would solve much of the issues that occur using traditional means. Not only does FBR offer solutions for the developed world, the technology is also required in third world countries or areas damaged by war and extreme weather events. Rather than have people displaced and without housing for extended periods of time, the Hadrian X would be able to work around the clock and rapidly construct houses that would otherwise take months to complete. The future of housing construction, as we’ve seen in almost every other sector already, will see technology become further integrated into its core operations and FBR want to be at the forefront of that change. However, it is hard to gauge what FBR’s overall impact will be, so seek professional financial advice if considering this stock for your portfolio. Having created the world’s first 3D printed multi-room structure, and nominated as a finalist for the Innovator of the Year award, shows that not only is FBR on the cutting edge of technology but also on the radar of government bodies. The upgraded version of the Hadrian 105, the Hadrian X, is currently under development and FBR plans to begin building its first homes in Australia in Q3 of 2017, with plans to manufacture around 8000 Hadrian X’s over the next decade. 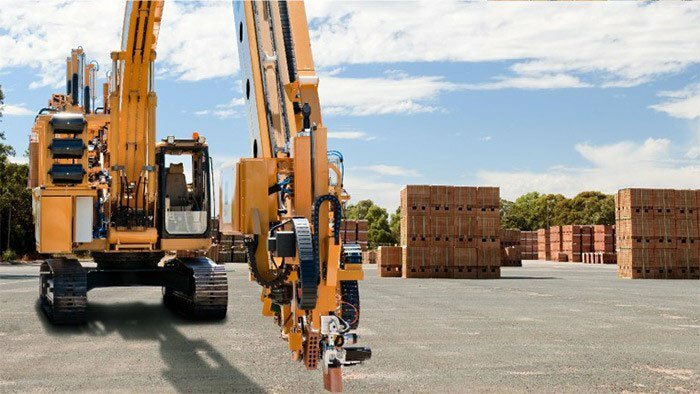 Able to lay 1000 bricks per hour vs the human average of 300-500 per day, the Hadrian X could be the machine of the construction industry future. The Hadrian X technology could revolutionise almost any sector of the construction industry, which is yet to experience any major upgrade through technology for over 6000 years... until now. The shift to superior technology in the construction industry is an inevitability and with FBR leading the charge to change the bricklaying game, they may be rewarded with a first mover advantage when rollout begins in 2018. Whilst they say Rome wasn’t built in a day, it sure would have been built quicker using the Hadrian X.